Disclosure – I was given a review copy by Eclipse Games. Tachyon Project is a dual-stick shooter with many different enemy types as well as many ship upgrades. The graphics are very colorful and vibrant. Each enemy type has a distinct look. There are various particle effects when you fire your ship’s weapons and when when enemies explode. The backgrounds and menus also look great. The sound is quite good. The ship and enemies and your weapons have different sounds depending on what you’re using. Also the music can be quite relaxing. The music ramps up during the more intense parts of the game. The electronic music soundtrack fits well with the game and sounds great. Tachyon project is a very solid dual-stick shooter. The game features full controller support and the controls are very responsive. The game is also playable using a keyboard and mouse but I would recommend using a controller. I played using a wired Xbox 360 controller. The game is split into two modes, a story mode and a challenge mode. In story mode you complete waves in each chapter resulting in a final wave. The waves in each chapter leading up to the final introduce new enemies. Each wave has a goal that must be achieved before moving on. These goals range from defeating a certain amount of a particular enemy type to surviving for a set amount of time. There are also cut-scenes in the game featuring a graphic novel feel with very good artwork. Throughout the game you can unlock different upgrades for your ship. These include new weapons, increased speed, increased health and so on. I like that mines are one of the possible upgrades. The proximity mine is especially fun to use. Drop one near a large group of enemies to wipe out a ton of them with one attack. The challenge mode is fun as well. These challenges include a limitless mode where you try to survive for as long as possible, a stealth mode as well as a timed challenge. Online leaderboards are also included. Overall Tachyon is a very solid and competently made dual-stick shooter. Whether you want to play a quick challenge or dive into the story there is something here for everyone. The game works for both short and extended gaming sessions. A great addition to the dual-stick genre. Tachyon project is available for Xbox One and PC through Steam. Disclosure – I was given a review copy by Proteus Pixel. Ted By Dawn is a retro style platformer with a flair for the insanely difficult. Be prepared to die…a lot! The game feels like a mix of Evil Dead and Super Meat Boy. The graphics in Ted By Dawn are done in a retro 8-bit style. There is not much to say about the graphics beyond that. Simple yet effective. The audio is also done in a retro style. The music is pretty good as well. The gameplay of Ted By Dawn is very simple and feels like a classic old-school platformer. The game is insanely difficult. There are man ways to die in the game and you get an achievement for discovering each of them. You can get eaten by zombies, stuck on barbed wire, fall on spikes and more. The game is a bit like Super Meat Boy as it is difficult but not to the point that the game is not enjoyable. You can attack the zombies with your shotgun or grenades. Be careful using grenades as you only have two of them. You can find more scattered around in some of the levels. Your shotgun holds two shots and can be reloaded. The game is a platformer so you’ll be jumping from platform to platform killing zombies in the process. You can utilize a double jump to get to some of the harder to reach areas. Some platforms will break once you land on them so you’ll have to work quickly to avoid falling to your death. Overall Ted By Dawn is a fun platformer. The gameplay is very challenging but also very rewarding once you complete some of the fairly difficult levels. The game is also a great value at being priced at $1.99, the game is currently on sale for $1.69 for the next day and a half. You get a lot of game for just a couple dollars. Disclosure – I was given a review copy by Kieffer Bros.
Blockwick 2 is an easy to learn hard to master block sliding puzzle game. There is not much to say about the graphics. They are quite simple and get the job done for this puzzle game. The music in this game is quite relaxing. The music can put the player at ease. Other sound effects are included for when blocks become connected or you find one the pearls hidden throughout the puzzle. Gameplay is where this game excels. The concept of the game is simple; connect the blocks to finish each level. You slide other blocks out of the way to accomplish this. This game reminds me of the game Rush Hour in which you need to move car pieces round in order for another car piece to be ble to move out of the grid. In Blockwick 2 you move the pieces out of the way so you can connect the pieces of the same color together. The earlier stages are quite easy but get more and more challenging. There are blocks that can’t be moved so you’ll have to figure a way to connect them to the rest of the blocks. Some levels have you connecting various blocks of different colors instead of just one. Some of the puzzles can be a mind bender. You’ll feel great once you solve a fairly difficult puzzle. There are multiple chapters in the game. Each chapter has a themed block. For example in chapter one you are trying to just connect the same colored blocks together. In chapter two unmovable pieces are introduced and in chapter three you have the entangled blocks that move as one unit. Each new block adds a new level of challenge to the game. 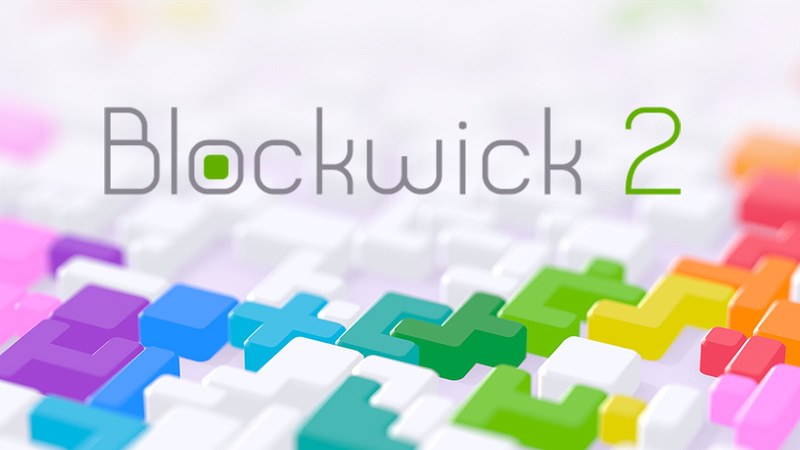 Overall Blockwick 2 is an excellent puzzle game. Each chapter adds a new element and the game is quite challenging yet relaxing at the same time. Highly recommended for fans of the puzzle game genre. Check out Blockwick 2 on Steam. Disclosure – I was given a review copy by Fire Hose Games. Catlateral Damage is a game in which you wreak havoc as a cat. You climb on shelves and topple objects off onto the floor below. There is an objective mode in which you are required to knock down a set amount of objects in a certain amount of time as well as “Litterbox Mode” where you can just mess around and knock objects down. The graphics are done in the cel-shaded style. The visuals look very nice and are a great addition and mix well with the destruction your cat creates throughout the game. The audio is pretty basic but works well in the game. You have cat noises of course as well as the sound of items breaking and crashing to the ground. The music is also very catchy and can be quite relaxing as well. The gameplay is very simple yet very fun. You can use either a keyboard and mouse or a controller. I played using an wired Xbox 360 controller. The game controls equally well with either setup. The controls are very simple. You your W, A ,S, D keys or joystick to move your cat around the level. You can then either use the right or left mouse buttons or triggers on your controller to swat at objects. The cat can also push objects by walking into them. There are several cat toys in the levels such as scratching posts, tunnel tubes and more. Playing with these objects will generate an upgrade box. If you swat at the box and break it you earn an upgrade. You can upgrade your swat, speed, and jump abilities. Events will also randomly trigger throughout the game. These include power outages, moon gravity, and laser pointers to name just a few. These add an interesting level of randomness to the game and can also help you achieve your goals in some cases. For example with moon gravity you can reach areas that you wouldn’t be normally able to jump to. The game also features various achievements and unlockables. You can unlock new cats, cat photos, and additional levels throughout your time in the game. Catlateral Damage is a lot of fun and can be played for a short or long amount of time. The gameplay is quite addictive and objective mode can be a challenge. If you like cats and want a cat destruction simulator this is the game for you. I recommend this game for those who like jump in and play sessions. If you are short on time a quick game in objective mode is right up your alley. There is something somewhat relaxing about knocking items off shelves while catchy music plays in the background. Check out Catlateral Damage on Steam. Disclosure – I was given a review copy of the game by Beast Games. Avalanche 2 – Super Avalanche is a “climb as high as you can” game. You play as a small marshmallow character and must climb up a series of falling blocks while trying to avoid the rising lava, being crushed by the blocks or being killed by various enemies such as dancing snakes, birds, carnivorous plants and more. The graphical style of Super Avalanche are done in a simple 16-bit retro style. The visuals are quite fun to look at and have a nice retro look. The audio is well done especially the music. The music is quite catchy and also feels like the music you’d find in a 16-bit retro title. The other sound effects of bouncing, picking up coins, breaking open treasure chests and so on are also all well done. The gameplay is where the game really shines. It is quite a simple game that you can pick up and play for as long or as little as you like. You can use either a keyboard or a controller. For my review I used a wired Xbox 360 controller. You control your marshmallow as you try to climb as high as you can. Throughout your climb you will find coins that you can use to purchase items from the shops that appear. You can also save your coins if you deposit them into a bank while climbing. You want to deposit coins so you don’t lose them when you die. There are also missions you can take which provide rewards for defeating a boss, climbing a certain amount of feet, “surfing” between bricks and more. you find these missions randomly throughout the game and you can then later go into your missions area and select which ones you’d like to attempt. The game features both single player as well as local co-op. You and a friend climb the falling blocks together. In between games you can use the coins you’ve earned to buy power-up for your marshmallow as well as customization pieces such as eyes, mouths, hair styles, and other accessories. You’ll also encounter various enemies as well as bosses as you continue to climb. Each boss has a different pattern and you’ll have to exploit their weaknesses to defeat them. Overall I am having a blast playing Super Avalanche. The gameplay is addictive and you can easily jump in or jump out of a game very quickly. The game is simple yet very fun. I recommend this game. It is currently on sale on Steam until June 22nd. I recap WWE Money In The Bank 2015 and give me thoughts on the matches. Launch Lego Worlds and go to the Models section and then click Brick Builds to see a lost of models and find your custom model and select it and then have your mini-fig build it.